One of the most enviably rated and historic educational institutions of this subcontinent - the St. Gregory's High School (SGHS) - awaits to celebrate its 125th founding anniversary on December 13 & 14, 2007. It is one of the very few schools that has served India, Pakistan and Bangladesh for such a long time. The school ground is abuzz again with old students, teachers and staff who are working day and night to make this event a grand success. In the eastern block a new six-storey building has come up replacing the old basketball court, football ground and covered handball court saying adieu to the old Victorian structures in which countless pupils saw light of education for over a century! The Gregorian (old boys) Association is working with the school in full steam to uphold the Alma Mater. 1882 - 2007 of St. Gregory's High School is but 125 years of fission and fusion of bits, bytes and pixels of education excellence and development. St. Gregory's continues to flourish today in a free and developing society far different than when it was founded during the colonial British rule. Today's SG has a Manging Committe drawn up from respectable citizens and Gregorians. Father Gregory de Groote had founded his tiny seat of learning - the St. Gregory's High School - 125 years ago. How little we know of those first few years! In the “Indo-European Correspondence” of March 21, 1883, an article states that the staff would be increased from two to four. But Father Gregory had many irons in the fire, and could not personally direct the nascent school. Twice started, it collapsed from lack of public interest. The second attempt at revival was taken near the old railway colony. 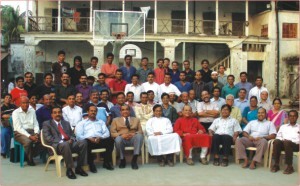 The Holy Cross Fathers and Brothers returned to Bengal after an absence of six years. Father Francis Boeres, c.s.c. nurtured it to develop into a sustaining institution for the next twenty years. In Jan. 1889 the school reopened on the ground floor of the present St. Francis Girls' School. Four Sisters and Mr. La Touche made up the staff, along with Father Boeres as Principal. The Inspector of European Schools granted recognition in April, 1889. In 1890 a Volunteer Cadet Corp was formed. In 1892 the roll held 26 boys and 19 girls. In 1896, Bishop Hurth, Father Boeres and twenty boarding boys moved into five new rooms, which are now the teachers' room, the foyer part of the hall, and two rooms opposite the front rooms. In 1897 these rooms were extended to the south. A second floor was added. The enrollment of boys and girls increased to 85. In 1898 quarters for the girls were enlarged on the other side of the church. Along with Eurasians, there were six Bengali boys and two Bengali girls. Two boys and a girl appeared in the University Entrance Exams. Additional land for south and southeast of the school building was purchased in 1906. The ground was leveled and a wall was constructed. By then there were 58 boarding boys. The total number of boys and girls was 122. The present library section was built in 1910. Fr. T. Crowley, later to be Bishop, was nominally headmaster from 1912 to 1915. In 1912 girls sat in the new St Francis' School. 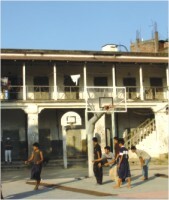 Numerous students from Chittagong left for that city and the enrollment of boys came to only 72, with 34 in the hostel. Mr. Andrew Gomes Doctor, a small boy from 1908 to 1911, recalls that the Headmaster's Office was located in the dining room. The room in the southeast corner was the Headmaster's Office. 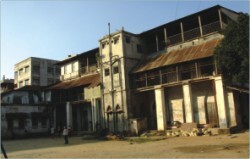 In 1914 the present Darjeeling Building was built. At that time the Scout Troop was started and it had 40 scouts. Late in 1915 Father Crowley resigned as Headmaster. The Scouts took part in two events to benefit the Scout Movement. This year Bengali replaced Latin as the second language. In that same year Bro. Eugene was going strong with his Cadets. Father Boulay was Headmaster at the time up to 1918. Actually Bro. Peter, c.s.c. ran the school as Father Boulay was recuperating in Shillong. From 1919 until 1921, Father Blinn was the Headmaster, but Father John Hennessy was the School Secretary who did all the work. In July 1923, Fr. Hennessy gained permission to change the European Style School to participate in the Board Examinations. On June 2, 1924 the recognition was granted; Father had pointed out that most brilliant Bengali boys wanted to take the matriculation examination but were not permitted to do so under the rules of European Schools. Father Hennessy had previously founded Bandura Holy Cross High School, and now had the satisfaction of placing St. Gregory's on the path to excellence and stability. In 1922, Bro. Bertin performed the duties of Headmaster. Father Finney acted as Headmaster during Bro. Anthony's sabbatical in 1925. The first Matric exams of the Dhaka Board had only one candidate, and he passed in the First Division. In 1927 a third floor was added for the Brothers. In 1926 the school sent three boys to the Dhaka Board Exams, all passing with distinction. In 1927, of the six candidates, 3 passed in the Second Division, two in the 3rd, and 1 failed. In 1928 results were better: of five, 1 passed in the First Division and 4 in the 2nd. In March, 1929 Brother Walter came from Bandura to become Headmaster at St. Gregory's. This charismatic man remained as Headmaster until January, 1938. The amazing development during his time set a congenial teacher-student harmony. The first "Gregorian" came out in 1933. 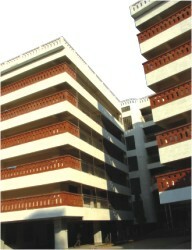 The present “hostel building” was built in 1931. In 1936 Bro. Walter went home where he passed away. In 1938, Bro. John Heim, a dynamic and friendly Headmaster, died in Shilong from Blackwater Fever. Bro. Bernardine then became Headmaster in 1939. From 1940 to 1950, a third eminent educationist became Headmaster. Bro. Jude during difficult times gained the highest reputation for the school by his infinite patience and devotion to duty. Our boys took from first to tenth places time and time again. He ensured 90% and above average on all exams. Like the days of Bro. Walter every year saw an addition to the sports begun by Fr. Hennessy. The Scouts and the St. John's Corps brought many laurels. The years 1947 and onward were not so happy years. In an emergency, St. Greg's opened its doors to offer space to Collegiate School. Then Notre Dame College began here as St. Gregory's College. To offer opportunity to students pouring into the country whose mother tongue was not Bengali it was decided to introduce the English Medium section. 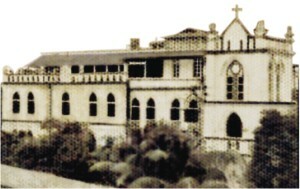 Under Brother James, from 1950 to 1955, St. Gregory's experienced its Golden Era. Education authorities urged to increase enrollment and this encouraged many enterprising boys to add glory to their Alma Mater. Mr. Nicholas Rozario, returned with his Cubs winning the First Prize in Chittagong. In 1954 six rooms were added on the roof to house the Brothers. On July 17th, our team won the City Football Championship. In 1955 the school enjoyed peace and progress. How blessed the school has been with teachers of the highest calibre : Bros. Martinian, Thomas More, Fulgence, John, Peter Nolasco; Mr. B. C. Choudhury, Mr. P. C. Sarker, Mr. Peter Costa, Mr. Nalini Sarker and Mr. Ganguly. In the years of Bro. James' administration, we had an excellent administrator and a literary genius as well. He has published several books, most notably an entirely new and pleasant formal of Tagore's "Geetanjali". Bro. Martinian was Headmaster in 1956. Bros. Peter Nolasco, Eligius, Beville and Donald Allen were with him. For the first time, the school became a matriculation examination center. From 1957 to 1962, Bro. Fulgence was our Headmaster. The enrolment went up to 894. Our cricket team took the School City Championship. On June 21st, 1958, our Bengali Medium boys presented a programme on Tagore's works. The Matric gave us 1st, 7th, 18th, 19th and 27th places. Brother Donald Becker put on the Gregorian Science Fair for the first time. Bro. Paul Malich helped out the science teachers in encouraging our boys. In 1960, Ahmed Shafee secured the First Place in Matric. Our Scouts went with Mr. Nicholas Rozario and Bro. Paul to the 1961 Rally in Lahore. Mahbub Hussain Khan of St. Gregory's took First Place in the Matric Exam. In mid-August, 1962, Bro. Thomas More became Headmaster, after being with us for so many years. St. Gregory's took 1st, 2nd, 3rd and 4th places in the Junior Group of the E. Pak Science Fair. On August 14, our Scouts and Cubs hosted a rally at the school with 2500 city scouts. National Awards were presented to Bro. Bertin, our former Headmaster, and to Mr. Nicholas Rozario. The year 1964 brought us the "Gregorian", and a flurry of farewell parties. Bro. Paul and Bro. Donald Becker were leaving. How can we forget those wise Prefects of discipline? March 4, 1965 had our boys winning the Provincial Basketball Championship. In 1966, February 2nd to be exact, our first "Spotlight" came out. Again we took the Basketball Championship. And, on Matric, we secured the 5th and 9th places. Bro. Donald was back with us, and the Science Fair was fantastic. He was also the driving force behind the wins we have in basketball. The S. S. C. for 1967 gave us the 1st and 8th places. Tagore's "Dak Ghore" was staged in mid-August. Our boys took all the prizes in the English Handwriting Competition of the British Council. Raqibul Hasan became Intermediate Champ in the City Sports. In the Pak Science Fair, our boys won the majority of awards. Abid Hasan, S. S. C., received a gold medal in the All-Pak Science Fair, and the title, “Junior Scientist". Our Scouts and Cubs won four Firsts and one Second prize in the Comilla Rally. St. Greg's won the Basketball Championship again. On S. S. C. we took the 17th place in Science, and the 19th in General Merit. On June 15th our boys gave a sad farewell to 'Bro. Thomas. Bro. Robert became Headmaster. Then started the civic disturbances. On a hartal day, after an operation and still recuperating, our good ol' Bro. Hobart had to walk all the way to the airport. On Feb. 27 Brother Gerald went to Mohammadpur St. Joseph's, and Bro. John took his place. On Matric we secured the 2nd and 11th places in Humanities. In August of 1969 Mr. Hardiment staged Shakespeare's “Macbeth". Dacca T V gave broad coverage to our Science Fair; also to a special programme by our Scouts. Then Mr. Hardiment's production “Macbeth" was filmed in the studio. We also secured a splendid trophy case, the former shrine of St, Philomena in the church. Just to go back for some touching details over the years. The story is told that one guardian wanted the best and so persuaded Bro. Walter to admit his girl into the primary. Each day, and as far as Class Seven, the girl came dressed as a boy. No other student even doubted her, “We never suspected that Shankar was a girl". Not long after she had left, some boys were caught pelting stones at the St. Francis' girls. Bro. Walter brought in one of the girls from next door to point out the boys. A brighter boy remarked, “She looks like our friend Shankar". Shankar!" Brother Walter explained the whole thing to the boys about Shankari. Believe it or not ! Bro. Hobart came to this country in 1948 and joined our school in 1961. Once a boy was chatting with Brother. He asked what Brother's final wish was; the answer is touching, "I am just the 'mali' working in a garden; the plants I raise and nourish are my kids; unworthy though they are, they are my flowers to bloom in the future.” “What could I wish more than to die as a gardener?" Our senior-most and most dedicated teacher was Mr. Nalini K. Sarker. He joined the school in 1936 when Bro. Walter encouraged him to become a teacher. The year 1971 is momentous for us all, for in that year we gained our independence. At the beginning, the school acted as a shelter, but on Mar. 31st, Pakistani soldiers -- without reason or mercy --hauled some of them into trucks. Mr. N. C. Sutradhar, Paul Palma, and Mr. D. N. Paul Chowdhury and his two sons Subal and Utpal were among the innocent victims. Bro. Hobart and Bro. Robert tried in vain to reach them in Jagannath College hall, where the hepless people were shot that very night. Another of our retired teachers, Mr. Peter D'Costa, was also shot in the village. The big consolation was that Gregorian Tajuddin Ahmed became the first Prime Minister of Bangladesh. The year 1972 began under the sovereign rule of Bangladesh. In all the confusion, the new adaptations and rules of the government placed the clock of education back. The standards and successes of St. Gregory's and many other schools fell to low levels. With the dropping of English Medium, and the unrealistic rules of curtailing students' fees, it is little wonder that any school could continue to exist. Some of our teachers were murdered; some of our best non-Bengali students were forced to leave. As bad as the year was, however, we did win the National Basketball Championship once more. In 1973 Bro. Hobart was absent, and Mr. ldris had to direct the “Alochhota" and the “Spot-light”. The S. S. C. results were fantastic, St. Gregory's boys snatched the 1st, 2nd,3rd and 15th places. They were Khondoker Nazrul Kader, Saad Khan, Habibur Rahman and Humayun Kabir. We celebrated our 75th year in 1974. Mr. John Rozario and Mr. B. G. Choudhry also retired this year. Bro. Robert also went on leave, and was accorded a Royal Guard of Honour by our Scouts at the airport. In 1975, our own Arup K. Roy also secured the Second Place in the Commerce Division. In June, with Brother Robert back in 1976, our Interact Club was inaugurated. Today that Club is the best in the sub-continent with many members. Our 1976 S. S. C. results were not up to the mark. They reflected the condition of the country, and only one boy got star marks. For the opening of school on Jan. 8, 1977, St. Gregory's glistened with a new coat of white-wash. We did lose in basketball to St. Placid's, however. On March 31, 1977 everyone felt gloomy. Bro. Robert bade farewell to become Headmaster at St. Joseph's. He had been Headmaster from June 15, 1968 to March 31, 1977, and "them wasn't a day that he did not have to contend with processions of every variety". He was the nicest person that St. Gregory's could ever have. His generosity and amiability encompassed every person in and around St. Gregory's. Bro. John Rozario took his place as Headmaster. At the end of the year we felt sad at the retirement of Mr. S. R. Choudhury and Mr. M. M. Ganguly, with a combined total of about 90 years to the school. The year 1978 found our school emerging from the doldrums. We again became the Basketball Champions. Our students did admirably at the Science Fair here in the school and the National Science Fair. Our S. S. C. results gave Rehmat lqbal and Musa Rahman the 11th and 18th places in Science. The school magazine, now under a committee of teachers, came out in 1980. In 1981 we again became National Basketball Champions. Our boys also took the First Place in the National Science Fair. February 18th was a red-letter day for us when President Ziaur Rahman visited the school on a flying visit to the old city. On S. S. C., Bazaul Huq was placed 13th, and many boys received star marks. Brother John, our Head-Master, resigned to become District Superior of all the Brothers, and Bro. Gerald became our new Headmaster. Brother John was a strict Headmaster, and he had to be too, in order to remedy and remove many drawbacks evident in the school. The school energized once again under the leadership of Br. John Rozario with the reunion of its old boys in 1981. The driving force towards this highly successful reunion was Grn. Dr. F.A. Azim (1956) and other fellow Gregorians like Bishwo Madhob Banik (1956), Yousuf Rahman Babu (1967), Shakil Kasem, Rizwan Khair (1974), Dr. Tanvir A. Khan (1968), Sawkat Osman (1968), Faisal Yousuf, Humayun Q Choudhury (1968), Aslam Khaleel (1978), Ahsan Habib (1979), Kaiser Huq (1979), Ehsan Khaleel (1980), Niamat Elahee (1981), etc. This huge success culminated in forming the backbone of the Gregorian Association (TGA) which finally took shape in 1985. This gathering heralded the Hundred Years of St. Gregory's High School. It brought back so many of our students resident in the country (and abroad), and messages of gratitude from thousands of our boys who are overseas. For the opening of school in 1982, all minds were focused on the events to come. In February, again the Basketball trophies became ours, for the City. Five of our boys won the Second Prize in the National Science Week. In April all the energy of Brother Gerald and our Gregorians was channeled into committees to prepare for the end of the year celebration. We had no worries at all, so far Brother Gerald cooperated and counseled all of us. Brother Gerald is truly one of the most active persons that St. Gregory's had ever seen and an architect of the modern St. Gregory's that we have today. He is at home in the position of Headmaster, friendly and considerate to one and all. His education policy is based on shared responsibility and respect for persons. He holds competition as the main aspects of his educational policy. He is stern and unyielding when he feels he must be, but in most things he is always eager to know, to understand and to encourage all. It is in his face, in his response, that he wants his students to grow up perfectly in their own individual ways. Only then can they tread the path of life as competent, confident, and independent Gregorians. Under his able leadership, the school with the help of its former students, successfully organised the Centenary of the school which was parrticipated by about a thousand Gregorians from Bangladesh, Pakistan and India. This success represented the intensive planning and synergetic work effect of the teachers, ex-students and staff with Br. Gerald as the central force. Br. Gerald retired as headmaster in 1991 and passed away while working in Chittagong. Beyond any doubt that has been the purpose of the school for the past Hundred Years. As Bro. Walter once so aptly wrote, “The Gregorian must be moulded to know his place in society, with his fellow man, and above all --his duties to God and Humanity". In 1998 the St. Gregory's rocked the world when its one time student Professor Amratya Sen won the Noble Prize in Economics. It drew more attention than ever when Professor Sen visited his childhood seat of learning in December 19, 1998. He dug the first ground at a brief ceremony for the new school building. On February 2, 1999, Archbishop Michael Rozario laid the foundation of the new six-storey building which is undergoing last moment finishing touces for the 125th celeberation. Again in 1999 SGHS drew global attention when one of its former students Osman Siddique (1967) became the first person to become US ambassador to Fiji and accompanied President Bill Clinton during his state visit to Bangladesh. In 2000 St. Gregory's entered its 118th year of existence and embraced the new millenium with fervour and festivity with students and alumni and with Fr. Peixotto in charge. Br. Robi came back and took charge as Headmaster & Secretary in 2001. Till this day he is steering St. Gregory's through the new millenium that Br. Gerald dreamed. In 2002 St. Gregory's saw one of its brilliant students Professor Badruzozza Chowdhury, who stood second in the combined Matric Examination of undivided Bengal, becoming the President of the People's Republic of Bangladesh. Beisdes that he already earned eminence as a physician. The Gregorian Association (TGA) gave him a lavish reception in the Osmani Memorial Hall. The academic achievements were quite notewotrhy in 2004. St. Gregory's was trying to come out of its hyberantion under the direct supervision of Br. Robi which was not an easy task given the problems of tradition, glory and decline. Five students got the primary scholarships and nine students got the junior scholarships in the talent pool. 27 boys got the GPA 5 along with 100% pass. Br. Robi and his crew seemed to have shaken the grounded (SG) ship - 29 boys got GPA 5 in 2005 with 100% success. The Gregorian Association arranged a grand reception for Br. Robi and the meritorious students. The school bade farewell to the four retiring teachers Mr. Phillip D' Rozario, Mr. Sukumol Bikash Saha, Mr. Proshanta Kumar Banik and Mr. Jeromes Gomes. The year 2006 is a mix of political and social turmoil. Amidst all these Dr. Md. Younus took the country to its zenith by winning the Nobel Prize for Peace. The SSC results also took a leap with 66 boys getting GPA 5. Mr. Mrinal Kanti Dey, the legendary Science teacher whose magical touch inspired countless students to become doctors, physicists, chemists, pharmacists and computer engineers, as well as renowned business personalities, etc. retired after 25 years of service. This year the Gregorian Association lost a very dedicated soldier Grn. Maidul Hoque (1965). The year 2007 is an acid test both for the St. Gregory's and the Gregorian Association (TGA) as both have joined hands in hosting the 125th founding anniversary of the school. At the time of writing this line hurricane “Sidr' has already struck the sea belt of Bangladesh at 240km/ hour and intermittent power failures has already put this document on recovery mode. Meetings are being held regularly in the school and in different places of Dhaka City, in different groups and committees to make the 125th celebration a success. There is endless supply of 'gorom puri', 'cha', 'rolls', 'garlic toasts', 'bakorkhanis' and other 'appetizers' from the kitchen of Headmaster Br. Robi, Brother Azim (73ers) and Brother Shameem (76ers) ... to keep the ball rolling. A documentary film on the history of St. Gregory's is being shot under the direction of business tycoon turned film maker Gr. Asfhaque Ahmed (1978). Good luck to him in the Cannes. Again in 2007 the school and the TGA were in for a big shock at the sudden demise of one of its most dedicated sons Gr. A. K. Faezul Huq (1958) who till the last of his day served the Alma Mater. The Gregorian Association has dedicated a scholarship programme in the school to remember and honour him. But, our present Gregorians are holding meetings doing planning unified to bring the 125th celebration to a successful conclusion. All this is visible proof to us all that a Gregorian is special; he is admirable in every sense; he is worthy of all the years that have gone by. And, as a Gregorian, I have a prayer in my soul and a lump in my throat in thanking all the teachers of St. Gregory's. . . . past and present : “God may continue to bless you and console you!" This history of SG will not be complete without the history of (TGA) the Gregorian Association (in Bangladesh). Similar associations also exist in Kolkata, Karachi, Chicago, New York and California. From 1985 to till this day the TGA has come forward to assist the school and its alumni in every possible way under the towering leadership of President A. K. M. Shamsul Azam (1956) and his entourage which sometimes included - Gr. Siddique Ali Mia, Gr. Bishwo M. Bonik, Gr. Yousuf Rahman, Gr. Osman Ali Khan, Gr. Late Faezul Huq, Gr. Late Maidul Haque, Gr. Humayun Q. Chowdhury, Gr. Tanvir Khan, Gr. Sheikh Shafiqur Rahman, Gr. Aslam Khaleel, Gr. Wasif Ali, Gr. Raqibul Hasan, Gr. Shahidul Azim, Gr. Rizwan Khair, Gr. Md. Nooruddin, Gr. Munadir Islam, Gr. Kamran Rahman, Gr. Asfhaque Ahmed, Gr. Dr. Naqibuddin Ahmed, Gr. Shameem Ahmed, Gr. Arefeen, Gr. Baqi Billah etc. Over tide and time . . . the St. Gregory's School and the Gregorian Association has become lifeline to each other . . .and will remain so . . . for times . . . to come . . . . The Gregorian Association (TGA) as well the School are a huge undertaking of Gr. Azam's time and energy that always seems to be in endless supply.